This is an oldie, but definitely a goodie in our family. Mom's been making this recipe for year's out of the Taste of Home magazine. We just had it tonight, actually, and I had to share it with you all. So delicious. We serve our's on white rice, though instead of noodles. Cut beef into 3-in. x 1-in. strips brown in oil in a skillet. Transfer to a 3-qt. slow cooker. Combine the next seven ingredients; pour over beef. Cover and cook on low for 5-6 hours. or until meat is tender. 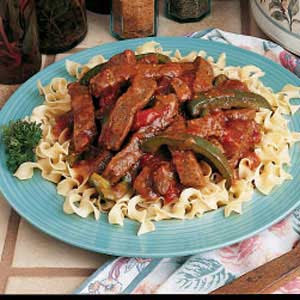 Add tomatoes and green peppers; cook on low for 1 hour longer. Combine the cold water and cornstarch to make a paste; stir into liquid in slow cooker and cook on high until thickened. Serve over noodles or rice. Yield: 6-8 servings. Mom made this for dessert tonight and oh.my.word. it was heaven on a plate. If you love chocolate, try this. And it's so stinkin easy! Prepare Pillsbury traditional fudge brownie mix as directed on package. Spread onto greased 12-inch pizza pan. Bake at 350 for 18-22 minutes: cool completely. Spread with 1 can Pillsbury Creamy Supreme Chocolate Fudge Frosting. 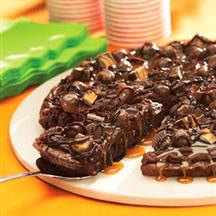 Arrange 3/4 cup chopped bite-size chocolate candies over frosting (we added crushed Heath bar). Heat a jar of Smucker's Hot Fudge and Caramel Toppings according to the label directions and drizzle over tip of candy. I've been having major problems changing my layout and background on here. Has anyone else had problems doing this as of late? I'm now stuck with a dumb blogger.com template that I don't like and now all my pictures of my recipes disappeared! I apologize. I'm going to have to try and upload all of them again soon. Most likely this weekend. So for now, you'll just have recipes. I'm annoyed. Big time. First off, I apologize profusely for not having posted anything in a month! Both my husband and I are currently in school for health care degrees as of the end of August and we barely have time to breathe anymore between school, homework, and work. But I've been wanting to share with you all a fabulous salad recipe that my good friend, Pam, gave me. Pam & her husband, Dave, had us over for dinner one night this summer and we enjoyed this tremendously yummy, and very simple, salad. :) So I asked her if I could share the recipe with you all. Here it is! 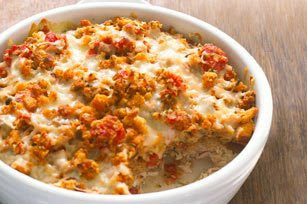 Bake chicken breasts in oven or crock pot. Cube chicken and refrigerate until needed. Boil red potatoes and cut into bite sized pieces. Chill. Cut up all the veggies into relatively small pieces. Mix 1 cup balsamic vinegrette dressing with veggies. Add potatoes, chicken, pine nuts, and cheese cubes to veggies in a big bowl. Add any extra dressing, if desired. Serve alone or on top of a bed of lettuce with additional dressing if desired. Combine all ingredients and shake vigorously.